Is Cape Town Pride too white? Cape Town Pride is once again facing charges that it remains too white, too middle class and out of touch with the interests and needs of the majority of the city’s LGBT population. Pride Festival Director Matthew van As has now responded with his own letter. The crux of his reply is that, while acknowledging that Cape Town Pride is indeed not as representative as it should be, this is largely due to only some of the city’s LGBT communities coming forward to volunteer their time and input to the festival. “If people want an event, they need to champion it. Pride has always worked this way. Let the African queer woman, the transman, the nonbinary individual, or intersex persons come forward and plan the events they would like to participate in,” van As wrote. Below, we publish both letters unedited and in their entirety. Let us know what you think about this issue in the comment section. I feel like that should cover what I have to say, but I also understand that you may not know what I am talking about. When I say you are too white, Cape Town Pride, I mean I don’t see myself able to participate in your events as a person who is fully aware of the lived realities of most LGBTIAQ (lesbian, gay, bisexual, transgender, intersex, asexual and queer) people living, working and studying in South Africa. • We’re returning to the rainbow? Your slogan for this year’s Cape Town Pride Week (February 20 to 28) is “Return to the rainbow”. Whose rainbow is this? The nine events listed on your flyer do not appeal to me – except maybe the movie night, but that depends on the movie. • Did you learn nothing from Jo’burg Pride 2012 and 2013? This is probably what upsets me most. Your older sibling went about hitting its head on these issues. People met after 2012 to consult and find a way forward that was balanced and brought back aspects of the political nature of Pride. They did the work so that you don’t have to go through the same drama whenever Cape Town Pride erupts. Because it will erupt. There are frustrated LGBTIAQ persons who will soon have enough of being rendered invisible. • Whiteness. Do you know what it is? You don’t? Really? Because you are doing it like a pro. Being “too white” is not limited to race – so your argument that everyone is welcome, regardless of race will not work here. What I mean by “too white” is that you are working from a position of whiteness and that you are maintaining this position through the events you have put forward for Pride, by charging for events (whiteness and class are very good friends) and by the spaces you have selected as “Pride space”. • Where is the broad variety of lived LGBTIAQ experience in your planned Pride events? Nothing in events such as the Pink Party, Ms Cape Town Pride, the Millionaire’s Gala Charity Dinner or Divas, Dames and Drags addresses the experience of the African queer woman, the transman, the nonbinary individual, or intersex persons who daily negotiate society, its obstacles, violence and ignorance. • Are you consulting the community when it comes to the planning of events? If you are, who are you consulting? And are you consulting in a way that is open to multiple experiences? Honestly, I look at your events and I see business and corporate interests first. I do not see civil society, I do not see the trans, intersex, asexual or queer community represented in your planned events. • Is there an organising committee? If yes, who sits on it and whose interests are being represented here? The events feel far too commercial for an event that should be transgressive and should advocate the rights of all LGBTIAQ persons. • Accessibility? Who do these events target? The spaces in which the Pride events are due to be held are spaces for those with money, transport and social capital. Do you have to charge those fees for Pride? A degree of gatekeeping takes place when a price tag is attached to an event: it says that only those who can afford to be in these spaces are welcome. And what about accessibility of persons – have you catered for physical, sight and auditory disabilities? Please think about all this. Not taking everyone into account makes this Pride noninclusive. You can’t claim to be returning to the rainbow if you’re only taking a few members of the LGBTIAQ community with you. Please put out an open call for your first planning meeting for Cape Town Pride 2016. Thanks for taking the time to write us a letter, which we unfortunately only heard of via Sivu Siwisa on Twitter. I haven’t had the privilege of meeting you at any of the Cape Town Pride Festival meetings and hope to see you at our next meeting when we elect a new committee for the 2016 Cape Town Pride Festival. We will, as per last year, advertise this meeting on our social media platforms, as well as our website. Not having attended any of our meetings yourself (we have no record of your name on our minutes), I assume that your opinion is based on conversations with friends. Nonetheless, it is still an important one, which we would like to shape, given the opportunity. It saddens us that you have not notified us of your letter yourself. We also haven’t had any communication from the Mail & Guardian team to ask for our comments or for a reply to your letter. This highlights one of the problems we have been experiencing – that people are eager to make statements and to highlight issues, but they are not willing to engage with others about these. We agree that our committee is too white. Of the seven members, four are white. This does not reflect the demographics of Cape Town. These people came forward during and dedicated themselves to various portfolios that they were comfortable with. Meetings were advertised on our social media platforms in August, October and December 2014 for people to get involved with existing and new events. We invited everyone interested in participating in the 2015 festival to attend. These meetings were attended by six people, of which two were white. Everyone who attended had the opportunity to make themselves available as candidates for the election and they also had the opportunity to vote for those candidates they believe should be part of the committee. During 2014 we also asked everyone who attended Cape Town Pride Festival meetings, and those who follow us on social media, to come forward with suggested events for the 2015 festival. We received two requests: one asking us to host a movie evening and one requesting that we bring back a book evening. These suggestions were discussed and a person championed each event. Some of the people attending did mention that they couldn’t relate to all the events. This we understand and we know that it will be impossible for all people to relate to all events. These specific people also didn’t give any suggestions for alternative events when we asked them to. I feel sorry, but also understand why you feel, that you can’t participate in this year’s events. I’m sure that there have been many others who have felt the same during any of the preceding years. I’ve found that people whose opinions are not voiced or heard feel excluded. During my three years as festival director I have given everyone the opportunity to voice any concerns and to make suggestions. Unfortunately most people don’t and in this way exclude themselves from much-need discussion around what events are relevant and needed. This leaves the responsibility of identifying events for the festival with a committee of seven members, each with their own unique lived experiences. The event suggestions that the committee members made have been presented to the members attending and accepted by them. We would be honoured if you attend our next meeting to share your thoughts and concerns. It is after all only possible for other people to try and understand your opinion and point of view and your reality, if you express it to them, and give them the opportunity to ask questions for clarity. We look forward to hearing your suggestions on possible solutions to your perceived problems too. I’ll gladly try and answer your questions. I don’t know of anyone who owns a rainbow. Rainbows consist of seven colours that, when viewed together, makes most people stare in awe. It is something beautiful to witness. The idea behind our theme “Return to the Rainbow” is to motivate people of all walks of live (from all races, genders and ages) to work and live together, in unity, and to remind everyone that we all deserve equal rights. I’m sorry but I don’t see people in Gauteng working together after 2012 and finding a way forward that is balanced. What actually happened in Gauteng was that Pride fractured. We certainly have learnt from this and that is why we’ve been inviting everyone to make suggestions. It is clear that you would like to highlight aspects of a political nature and how it relates to LGBTIAQ life. You are welcome to bring attention to these. We’ve never prohibited anyone from voicing their opinions during the Cape Town Pride Parade, which is one of the events we host. You have to however remember that there will be some people who don’t relate to your opinions and point of view and that these people are allowed to express their opinions too. Some people might want to celebrate rather than protest. If I understand you correctly you are implying that only white people are able to pay to attend events? Have you noticed the non-exclusive party happening on 27 February in the City Centre with a R30 cover charge? If people want an event, they need to champion it. Pride has always worked this way. Let the African queer woman, the transman, the nonbinary individual, or intersex persons come forward and plan the events they would like to participate in. Unlike you we do not claim to understand the lived experiences of these various groups and therefore rely on their contribution and efforts in making these events happen. We consult people who show interest in Cape Town Pride Festival. Therefore people who attend our meetings and who engage with us via social media, emails, telephone calls and visits. It is obviously impossible for each and every person to attend each meeting and we find that in this case some community members ask individuals to represent them during our meetings. Cape Town Pride Festival, which is a week long, doesn’t just happen, unfortunately. It takes lots of time to plan and resources to execute. Unless there are individuals who are willing to pay for all the services required to host the event, I do not see us hosting the event without the financial support from sponsors. You want the events to be free of charge, which means we will need even more sponsors to come on board, which in turn, according to you, would make it even more commercial. Do you have any other solution? If you had taken the time to look at our website you might have noticed that we have a committee consisting of people in various portfolios. These people, and many others who are not necessarily part of the committee, champion events that their lived experiences allow them to create. They find sponsors, delegate tasks to volunteers and see that the events are executed. None of these people are paid for their time and work. 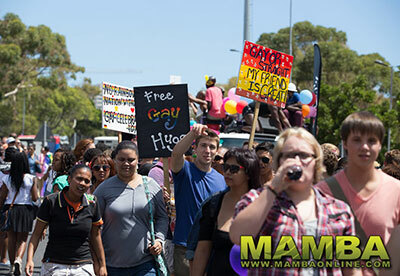 Cape Town Pride Festival is aimed at the LGBTIAQ community. Our events are hosted at venues that make themselves available and at venues that people from the community have approached that are willing to work with us to make the event happen. Community participation is key. Our events therefore happen because the people who suggest these events are willing to put in the hard work of organising it. We’ve had people at our meetings who’ve suggested events, that they would like to happen elsewhere, but these people are not willing to make work of their suggestions. Somehow they just want them to happen. Yes, as explained we need to, in most cases, charge for events. The purpose of having a cover charge is to raise funds that will be used towards projects that we run or participate in and in some cases to pay for the use of venues and equipment. The accessibility of our venues for people with physical, sight and auditory disabilities mostly depends on the venues that are willing to host us. We certainly don’t have funds to change the set-up of each venue. We welcome any suggestions on venues that can accommodate people with disabilities, we welcome suggestions of events that are more inclusive of such people and we welcome the participation of people who are determined to make these events happen. We look forward to meeting you at our planning meeting for Cape Town Pride Festival 2016 and will, like previous years, advertise the details about the event on our website. Well said Matthew. Having been on the Pride Board and Committee for a few years some years ago, I know what a thankless job it is and there will always be detractors. Let's hope THEY make the effort to make CT Pride more inclusive next year.